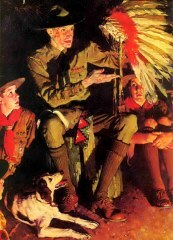 1st scout "Hey George, look over there, smoke signals"
2nd scout "Oh ya , what do they say?" "Help... My... Blankets... On... Fire. Customer: "Waiter, waiter, there's a fly in my soup ! " "Oh, yes, you are right sir. That will be an extra 25 cents for the meat. " Customer: "But waiter, he's swimming all over the top ! " Waiter: (Still snooty) "You are right, sir. It doesn't know it's a fly, sir. It's doing the Butterfly stroke. " Customer: "Well, I think it must be an Australian ! " Waiter : "Why do you say that sir ? " Customer: "BECAUSE IT'S DOWN UNDER NOW ! "